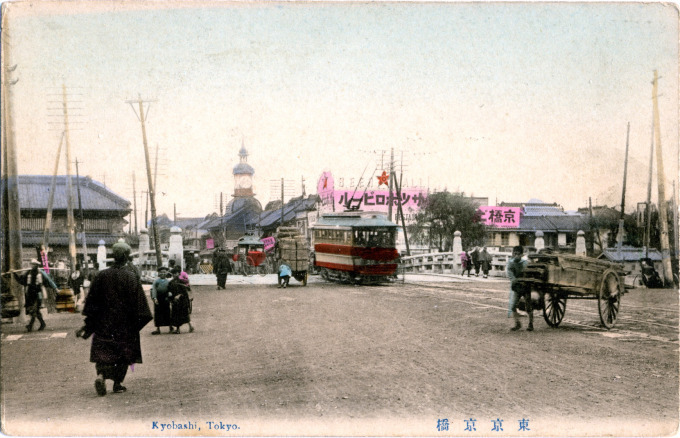 Kyobashi (Capital Bridge), c. 1910. Kyobashi Bridge, ca. 1910, with the Sapporo beer hall beyond at right. The stone bridge structure in this postcard image, completed in 1889, would be replaced by a steel span in 1929. The importance of Kyobashi [capital bridge] touched both the practical and the artistic. During the Tokugawa era, when Edo served as the administrative capital of Japan while the Emperor remained esconced, under guard, in the Imperial capital of Kyoto, there five major highways, the Go-kaido [five town-roads], connecting Edo with Kyoto. The most famous, and most traveled, of the Go-kaido was the Tokaido [east town road] along which were positioned 53 stations made famous by ukiyo-e artist Hiroshige. Leaving the Edo capital for Kyoto along the Tokaido, the first station reached was Kyobashi, so-named for its close proximity to the “center” of feudal Japan, Nihonbashi. The first bridge at Kyobashi was built in 1603, shortly after the Tokugawa shogunate began, and was thereafter rebuilt on numerous occasions. The stone and concrete structure, seen in the above postcard image, was erected in 1879. It would be replaced in 1929 by an all-steel span. After the imperial Restoration (1868), Kyobashi developed its importance as a commercial and mercantile center. Fujioka Ichisuke and Miyoshi Shoichi established Hakunetsu Kabushiki-kaisha at Kyobashi in 1890, to manufacture Japan’s first incandescent lightbulbs. In 1899, the company was reorganized as the Tokyo Denki [Tokyo Electric Company] and merged in 1939 with Tanaka Hisashige’s Shibaura Seisaku Sho [Shibaura Engineering Works Company]. The new company became known as the Tokyo Shibaura Electric Company: Toshiba. 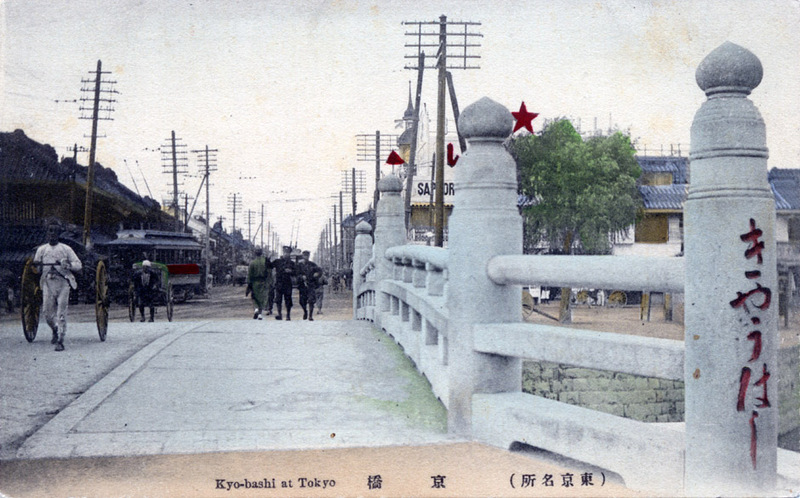 Kyobashi bridge, c. 1910. Looking south toward Ginza Crossing. Behind the tram is a Sapporo beer hall; the clock tower is the Hattori building at Ginza Crossing, where the Seiko watch company was founded.